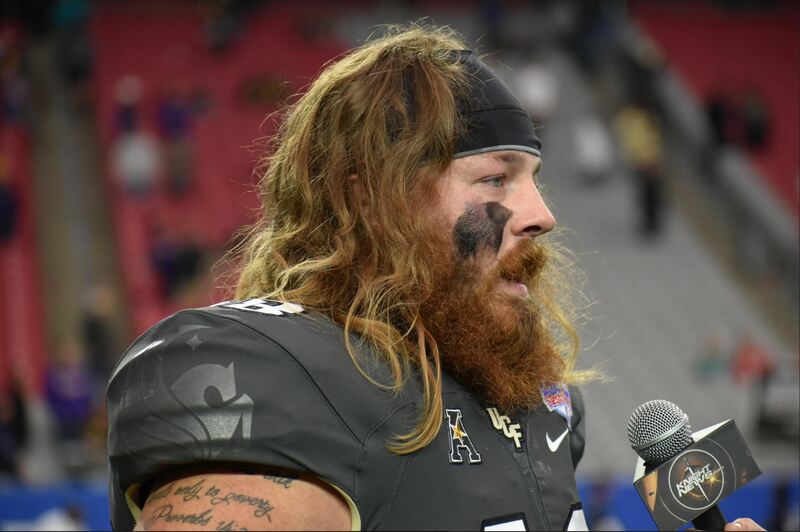 UCF punter Mac Loudermilk shaved his beard Tuesday night, the first phase of a promise he made prior to the Fiesta Bowl. Loudermilk announced back in early December that he would be cutting his hair sometime early in the new year and donating it to Locks of Love, a public non-profit organization that provides hairpieces to financially disadvantaged children suffering from long-term medical hair loss from any diagnosis. He posted a video on social media as he parted ways with his beloved beard. Next to go: his lion’s mane. Loudermilk said he plans to chop off the rest of his hair on Friday. Some UCF fans are sad to see Loudermilk’s hair go since it was such a fundamental part of his brand, but most agree that the cause is well worth the sacrifice. In addition to cutting his hair, Loudermilk also set up a GoFundMe page last month for Locks of Love, raising over $4,500 for the cause. If cutting my hair changes a kids life so that they have more confidence in themselves, then I’ll always do that,” Loudermilk said.